Lachoo Management Journal is an initiative in the field of management education to provide an effective forum to academicians as well as practicing professionals to present their original studies. This journal seeks to embrace the entire area of issues regarding business, management education, organizations and society with their practical implication for enhancement in respective areas. Lachoo Management Journal is a theme based half yearly publication of Management Studies, Lachoo Memorial College of Science and Technology. The journal welcomes papers from the areas such as finance, accounting, marketing, operations management, human resource management, statistics, international business, information technology, environment, risk management, globalization and related areas. Papers reflecting diversity, cross-functional nature of management and emerging concerns are also considered for publication. In every issue of Lachoo Management Journal we will try to incorporate the works related to a specific area. The present issue of Lachoo Management Journal covers a wide range of scientific, conceptual and policy papers from the researchers of different parts of world. For this inaugural issue we have included papers on a wide range of topics but in coming issues we will try to incorporate papers pertaining to a single theme. 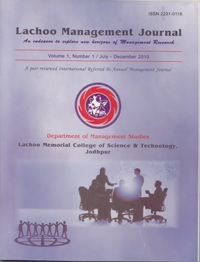 With the support and cooperation of academic community, Management Studies, Lachoo Memorial College of Science and Technology, aspire to make Lachoo Management Journal a forum to bring out various opportunities and innovate new techniques to cope with emerging challenges of corporate world.